Anniversary Delight features 14k gold bonding accompanied with a brilliant 2 carat center CZ flanked by a bunch of round cut yellow CZ in pave setting. 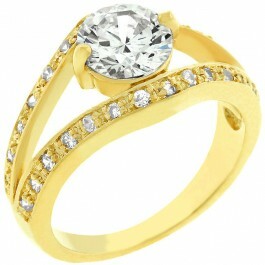 This ring will make your eyes light up with glee. 14k Bonded Gold is achieved using an electroplating process that coats the item with heavy layers of 18k Yellow Gold and color-treated to a perfect 14k Hamilton gold color.